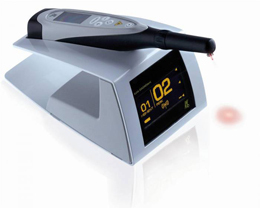 Our intra-oral cameras allow us to instantly show you what we see when we examine your mouth. The images are captured and displayed on large tv monitors enabling us to show you every aspect of your mouth. We use these in every treatment room in the practices. We use the latest digital sensors to instantly display your x-rays on our computer monitors. The dose is lower than old film technology and we can magnify the images as well as seeing them on any monitor we choose. These are ideal for reshaping the gum line, removing excess gum, stopping bleeding around preparations, treating ulcers and for performing various surgical operations where we want fast healing. There is generally much less pain after treatment than when using conventional surgical techniques. This hand held device detects cavities in your teeth without the use of X-rays. It is totally painless and gives an instant reading.